Dear VedaPulse™ users! If you have questions on the use of the device, you can contact our Customer Support to get answers to your questions. I’m afraid my patients will get an electrical shock. How safe this device is? After installing the program the device does not work. What should I do? During the monitoring of the ECG signal strong interference can be seen on the graphics. What is the reason and how to avoid this? I don’t have two free USB-ports at the same time on my laptop and I cannot connect the USB key and the device simultaneously. What can I do in this case? How to make a backup (copy) of all surveyed data, or a patient? If I remove the old version of the program before installing a new one, will I lose all the survey data? I bought VedaPulse™ with one USB-key. Can I use the software on two computers, for example, stationary and laptop? What happens if I lose my USB-key? Would it be possible to recover it? New users often have difficulties in setting the threshold voltage. Electricity is not supplied to the wrist electrodes during the survey. There is only weak electric potential that is measured, which generates the heart itself. The device is designed in such a way that direct electrical connection between the computer and the electrodes is eliminated. 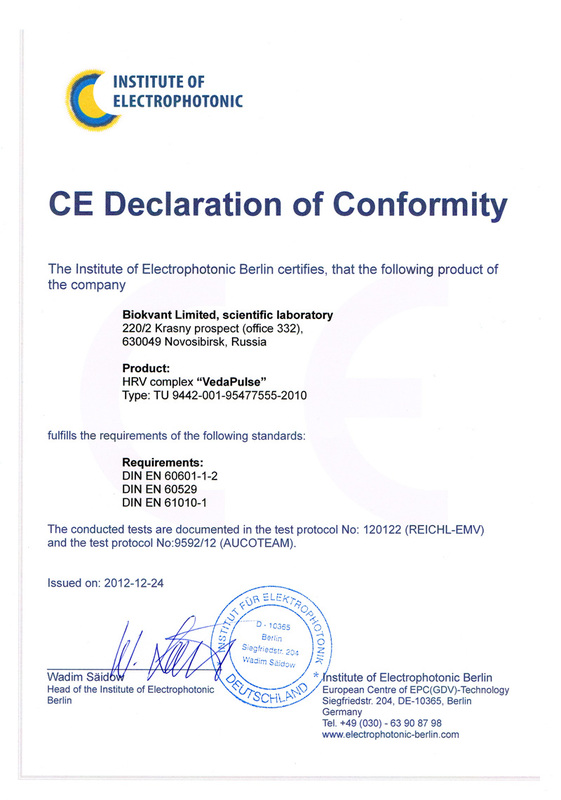 As an proof, VedaPulse™ has received an electric safety certificate. A). Make sure that your device is properly connected to the PC or laptop. Green LED lamp should be blinking on the side of the device. If this warning occurs, try to re-install the driver. The entire program does not require reinstalling. 1. Disconnect the device from your computer. First of all, the reason may be in poor electrical contact between the surface of the skin and the electrodes. In most cases it is enough to re-moisten the contacts with water or a special conductive ECG gel (after a survey, to avoid the formation of crust , which can also cause poor electrical contact, gel should be removed thoroughly with a damp cloth). The second reason is the proximity of powerful sources of electromagnetic fields (various electrical appliances, cell phones, electrical wiring, power supplies , etc.) If the problem is not the source of electromagnetic fields, it is recommended to unplug the laptop (on which the recording of the survey is conducted) and use the battery internal battery. The third reason is a high electric resistance of the patient's skin (individually), which reduces the power of the desired signal in relation to the interference. In such cases, change the position of the electrodes in the second abduction (electrode with the red wire - on the right wrist, the electrode with the black wire - on the ankle of left foot). As a rule, the use of the above techniques can eliminate noise and get recording signal of the desired quality. First, all laptops have at least two USB-ports, but often one of them is busy with the mouse. A simple solution: at the time of the survey temporarily disconnect the mouse and use the touchpad. After the survey, you can disconnect the device, detect the signal and plug the mouse back. (To work with previous surveys, it is enough to insert USB key and run the program. The signal recording device is only necessary to carry out surveys. Second, you can use USB-hub. Keep in mind that only USB key can be inserted in the USB-hub and not the cable of the device for signal detection. When using a USB-hub, make sure that it provides a high-quality contact, and the USB-key LED is lit. If a second USB-port is busy with something other than a mouse, such as USB-modem, then you need to disable it at the time of the survey. Moreover, the active Internet can be an additional obstacle for the survey on old computers. If any program (for example, antivirus updates, automatic checking email, Skype, etc.) can access the Internet at the time of the survey, it can significantly load the CPU and lead to loss of the ECG recording. (This problem is mostly the case with portable netbooks. Therefore, when working on old computers, it is desirable to close all running programs. And when working on powerful computers, there is no such problem. For example, you can use Skype while conducting a survey. In this case, it is possible to compress it with any archiver. For example: Student0001_John Smith (The serial number and the name of the patient may be different). When you uninstall the program via Control Panel \ Add or Remove Programs, you remove all program components. But the data itself is stored in the folder, where the program was installed (default: C:\Biokvant\VedaPulse\DB). Yes, of course. To do this, you should install the software on both computers. Before you running a program, please remember to insert the USB-key into a computer where you plan to work. Please remember that surveys are stored only on the computer, where they were conducted. If it is necessary to transfer the survey, please refer to the procedure described in the answer number 5. Yes, you can recover it. To do this, please contact our Support at support@biokvant.com. Please note that this is a paid service.